Sir Francis Carruthers Gould ('FCG'), caricaturist and political cartoonist.] Autograph Letter Signed ('F Carruthers Gould'), declining (as assistant editor of the Westminster Gazette), with much regret, an article by F. W. Sherwood. On letterhead of the Westminster Gazette, Tudor Street, Blackfriars, E.C. [London] 22 September 1896. Offprint from 'The Birmingham Pictorial and Dart': lithographed illustrations by E. C. Osborne & Son, New Street, Birmingham; theh page dated 19 March 1897. Facing page dated 16 March 1897. 2pp., 4to. Printed in black on the inner two pages of a bifolium. The left-hand page (i.e. verso of the first leaf) carries text, in two columns of small print, of a prospectus for a share flotation for 'Hanman's Cycle and Needle Co.', dated 16 March 1897. The facing right-hand page (i.e. the recto of the second leaf) is headed 'Twenty-first Year | No. 1,065.] The Birmingham Pictorial and Dart. [Friday, March 19th, 1897'. It carries Mountfort's lithographed illustrations, with a facsimile of his signature at bottom right, printed by 'E. C. OSBORNE & SON. LITHO. NEW ST.
On his letterhead, Hassall House, 29 West End Road, Cottingham, Hull. 4 January 1954. 1p., 4to. In good condition, lightly aged. He is enclosing 'Squeaker Toys', which are 'a few of a large series which I designed for a toy Firm'. He thinks they may assist Adams 'to get interesting "expressions" on the faces of some of your less sophisticated sitters!' He concludes: 'They would be a variation of the old request to "Watch for the dickey bird."' Adams was Britain's foremost children's photographer, patronised by the Royal Family, and was famed for his Dover Street studio disguised as a children's playroom, complete with toys. [ George Cruikshank, English caricaturist. ] Cabinet card photographic portrait of 'Mr George Cruikshank' by the London Stereoscopic and Photographic Company. The London Stereoscopic Company, 110 & 108 Regent Street and 54 Cheapside [ London ]. Undated [ circa 1873? ]. Albumen print photograph, dimensions 15 x 10 cm. Mounted on 16.5 x 10.5 cm card. Printed in red ink on the reverse of the card are the firm's illustrated details ('Photoraphers to the Queen the Prince of Wales and other members of the Royal Family' and 'Prize Medal For Portraiture Vienna Exibitiion 1873.' In fair condition, lightly aged and worn. The National Portrait Gallery lists four versions of this image, but not within an oval, as here. [ Charles Cole, cartoonist. ] Signed photograph, accompanied by Typed Note Signed to 'Mr. Wakefield'. Note on letterhead of 'Charles Cole | Cartoonist', 1 Montrose Court NW11 [ London ]; 28 September 1945. Cole's inscription on photograph dated 1945. ONE: TNS. 1p., landscape 12mo. In good condition, lightly aged with nick to corner. Letterhead features two small cartoons: a caricature of himself and a lion. Covering letter sending 'herewith my autograph for your collection'. TWO: Signed black and white portrait photograph of Cole. 8 x 5.5 cm. In good condition. Signed at bottom right: 'Sincerely | Charles Cole | 1945'. Cole has rather disappeared under the radar. [ Printed item, with sixteen illustrations of 'Gibson Heads'. ] Proofs of Drawings by Charles Dana Gibson. (Size 15 to 20 Inches.) Hand printed on Japanese tissue paper, mounted on boards ready for framing. James Henderson & Sons, Red Lion House, Red Lion Court, Fleet Street, E.C. Undated [ Edwardian ]. 4pp., 8vo. Bifolium on shiny paper. In good condition, lightly-aged. The front cover carries a reproduction of the print 'Wireless Telegraphy.' Pp.3-4 carry reproductions of the 'Gibson Heads': 'NOW READY. - A Series of Sixteen Gibson Heads, of which the accompanying illustrations are miniatures. | Each subject is Hand-Printed on Japanese Hand-Made Tissue Paper, mounted ready for framing. Price 5s. 6d. each, post free.' Scarce: no copies on WorldCat, or on COPAC. [ Linley Sambourne. ] Large printed 'Memorial Card', carrying engraving of 'the Liberal Monument to Mr. Gladstone erected within the Palace of Westminster'. Without date or place. 'Linley Sambourne invt et delt V & C'. Printed in black on one side of a 19 x 29 cm piece of stiff card, with rounded corners. In fair condition, lightly-aged, with 4cm vertical closed tear at head. The memorial to a stern-faced Gladstone is depicted - a setting sun blazing behind it - between two mythical seated women, Justice on the right, and a hooded woman with a hand mirror on the left. In the background are the Houses of Parliament and Westminster Abbey. The card is made out in manuscript to 'Edward C Young' (with '186357' at foot), and the caption at the foot reads: 'This Memorial Card was issued to [ Edward C Young. [ The Royal National Lifeboat Institution. ] Transparencies of two charming illustrations, one a ragamuffin boy fisherman, and the other his sweetheart waving goodbye to him. Both transparencies negatives on plastic sheets. The two images attached by a thin vertical strip of Scotch tape. On the right (22 x 14.5 cm) the image of the ragamuffin boy fisherman, with net and rod, looking to the left. On the left (22 x 16.5 cm) his young sweetheart, with fishing nets aand lace apron, waving a lace handkerchief. His image with caption (old Breton poem): 'Dear God be good to me | The sea is so wide | And my boat is so small | Sold in aid of the R.N.L.I.' Her image with the same caption, but with the word 'his' replacing 'my'. [Six folio coloured prints by Italian cartoonist Ugo Marontonio, each signed and numbered by him.] Così va el Mondo. 6 proverbi veneti scelti da Giovanni Vicentini. Illustrati con 6 litografie originali di Marantonio. No. 164 of 250 copies. Curata da Tamari Editori in Bologna per la Gemmo Impianti S.p.A. Undated [1970s?]. Folio folder of red card, with title printed on cover in black, containing the six prints, each on a separate piece of thick wove paper (almost card), with a bifolium of the same paper carrying the title leaf and limitation (164), as well as a page of letterpress by Vicentini. Internally in good condition, with one corner bumped; in worn and aged card folder. Each cartoon is signed in pencil by Marantonio in the bottom-right corner, with the limitation '162 [sic] / 250' in the bottom-left corner. Six crisp and elegant designs. [David Low (1891-1963), cartoonist.] Autograph Letter Signed to Anglo-Irish poet Sylvia Lynd, a letter of condolence on the death of her husband Robert Lynd. [Walt Disney and Mickey Mouse.] Black and white cartoon titled 'Touchdown Mickey' (1932), on spool of 9.5mm Pathescope film. In original box. In very good condition, on brown spool 16.5 cm (6 1/2 inches) in diameter. In 17.5 cm square cardboard box, with title label on spine reading: 'M.30504 TOUCHDOWN MICKEY | FILM PRINTED IN ENGLAND', and broken blue label: 'GUARANT BAND | PATHESCOPE LTD.' The film was originally released by Disney on 15 October 1932 and runs to 6 mins 25 seconds. Mickey Mouse leads his team Mickey's Manglers to victory over the Alley Cats, as Goofy bungles through as sportscaster. 16pp., folio. In fair condition, on aged and worn newsprint with short closed tear at spine. Spoof articles ('The Secrecy of the Ballot', 'What the Villagers might make of the Parish Councils. By A Villager', 'What the Bishops tried to make of the Parish Councils', 'The Great Liberal Budget and the Wail of the Landlords', and others), with caricatures by Gould featuring Rosebery, Gladstone, Salisbury, the Archbishop of Canterbury and others. Also two full-page cartoons by Gould, titled 'The Tory Village. Original Victorian pencil cartoon by E. R. White, titled 'Photo-"Graphic Rivalry"', depicting neighbouring photographers attempting to sell cartes de visite to a figure resembling John Bull. Dated by White to January 1862. On 20 x 24 cm piece of thick laid paper. A spirited and highly-finished cartoon, apparently unpublished. The two photographers have emerged from neighbouring doorways to solicit a portly Englishman, attired like John Bull, who holds his hands up in a gesture of exasperation or refusal. He is accompanied by a young boy, hands in pockets. The photographer on the left is dressed in the French or Italian style, back to the viewer, waving his cartes de visite around. 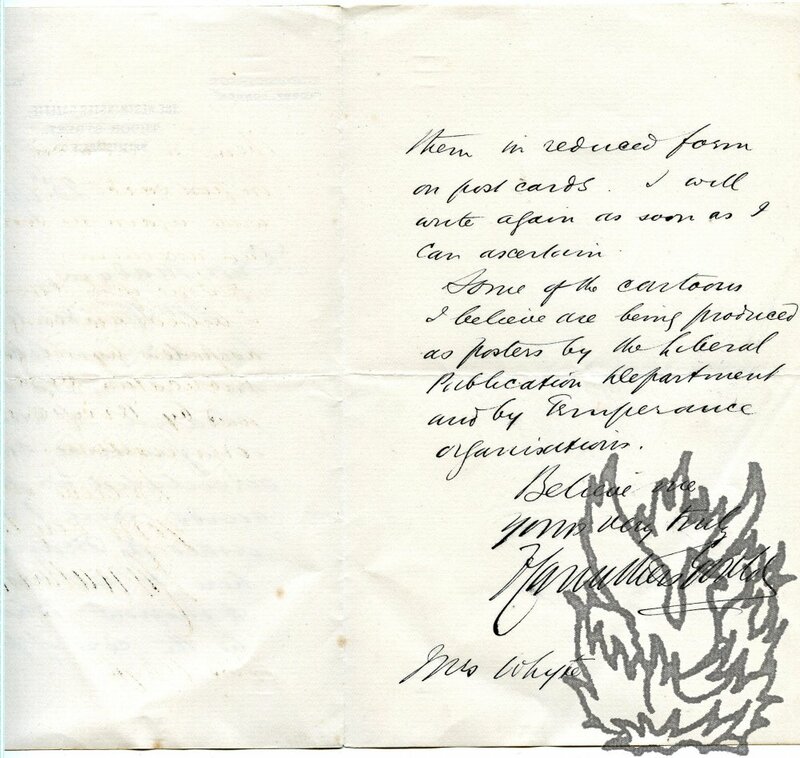 Autograph Letter Signed ('L Raven HIll') from the illustrator and Punch cartoonist Leonard Raven-Hill to J. P. Brodhurst [J. Penderel Brodhurst], regarding 'the entire copyright of all my drawings that appeared in the Pall Mall Budget'. 20 North Side, Clapham Common, SW [London]. 19 December 1898. 2pp., 16mo. Bifolium. Very good, on lightly-aged paper, with small hole through both leaves at top inner corner. Beneath the signature the faint stamp of the St. James's Budget, 15 Dorset Street, EC. Raven-Hill points out that the Pall Mall Budget had only the right to use his drawings 'in that paper', and that he holds 'the entire copyright of all my drawings that appeared' in that magazine. 'If you want any of mine you could of course get the blocks from them & we could come to some arrangement about using them'. Original comic watercolour, elf-like child chasing rabbits through woodland, with toadstools in foreground. Watercolour, c. 23 x 9.5cm, inscribed "FOR ELIZABETH .... FRON. JESSIE.M. KING". It was the centre-pages of a small autpograph album belonging to Elizabthe Hood, daughter of J. C. F. Hood, sometime Chaplain of HM Forces, and Helen Patuffa Hood, née Kennedy-Fraser, noted collector of Hebridean songs. Perhaps a Scottish arts connnection between King and the Kennedy-Frasers? A scan may be found on my website. Hand-coloured watercolour and ink original cartoon artwork published in the 'Solicitor's Journal', with accompanying note. On piece of paper 35 x 22 cm. Dimensions of illustration 32 x 19 cm. Striking illustration, predominantly in dark-blue, purple and grey, showing three City office blocks, topped with the names 'FRESHFIELDS', 'LINKLATERS' and 'CLIFFORD CHANCE', dwarfing a two storey Victorian house. Anonymous businessmen trudging zombie-like towards the blocks, and a smiling figure with his hand in his pocket walking towards the Victorian house, which is cheerily-lit in orange. A note (by Blower? ), stapled to the margin in the top left-hand corner (not affecting the image) reads 'Colour match. 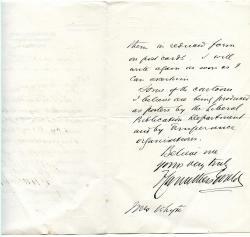 Autograph Letter Signed ('F Carruthers Gould') to 'Mrs Whyte'. 23 April 1908. On letterhead of The Westminster Gazette. Original black and white pen and ink cartoon artwork for the Solicitor's Journal. Dimensions of image 20 x 13.5 cm. On piece of paper 29 x 21 cm. Very good, with four unobtrusive marks and pencil numbering in margin. Taped to backing board and with paper cover. Depicts a suited individual trudging down a corridor festooned with gadgets, including two small beeping television sets attached to his head, a mobile phone in a holster, with bullet belt marked 'BATTERIES', a large camera on his belly, a fax machine draped around his neck, and a suitcase marked 'PC'. Bemused individual looks on from doorway. Original black and white pen cartoon artwork for the Solicitor's Journal. Dimensions of image 19 x 15.5 cm. On piece of paper 29 x 21 cm. Very good, with unobtrusive pencil and ink marks in the white space above the image. Taped to backing board and with discoloured paper cover. Shows a dorkish figure wearing a baseball cap marked 'C.S.T. ', which has two small televisions on springs over the ears. Ink cartoon of Payne's penguin 'Squeak', signed 'A B Payne' and created for the autograph collector J. H. Roberts. Austin Bowen Payne (1876-1956), Welsh cartoonist best-known for his creations 'the pets': 'Pip, Squeak and Wilfred' which featured in the Daily Mirror from 1919 to 1955. Very good, c.9 x 16cms, neatly mounted on larger piece of card. Full length drawing of 'Squeak', holding a letter, with the envelope on the floor, and shouting to Payne's baby rabbit 'WILFRED! - WHERE ARE YOU? MR J. H. ROBERTS WANTS YOUR AUTOGRAPH!' Signed beneath the speech bubble 'A B Payne - | 26'. According to one authority 'Fans of 'the pets' included Prince Charles, Spike Milligan, Peter Cushing and Paddington Bear creator Michael Bond'. Autograph Letter in the third person to Messrs A. & C. Black, 4 Soho Square, London [publishers of 'Who's Who']. 8 October 1900; on letterhead of Schloss Bendeleben [Germany]. 8vo: 2 pp. Good, on lightly-aged laid paper with slight chipping and glue stain at head (not affecting text). A formal letter written in English in the third person. He asks them to send 'another form [for him to write his entry in 'Who's Who'] to be filled up [...] The first one sent was mislaid on leaving London'. Deichman was the subject of a 'Spy' cartoon ('Vanity Fair', 14 May 1903: 'He wears curious hats'), in which he is shown driving a coach. Autograph Letter Signed, to unnamed correspondent [George Cruikshank]. "Frank Fairleigh". Novelist (1818-1864). Three pages, 8vo, bifoliate, sl. dusted, mainly good. "Mr. Austen seems to have written word for word what you wished said abt. Tobacco, but if there is to be much attraction abt. the article, your clever pencil must put it in, for, as it stands it is dull as . . . I was going to add ditch-water ("water" underlined] but I beg to apologise for the inadvertence - as [page 2] the worst kind of fermented liquors! -/ I send by todays post a Prospectus to Mr.